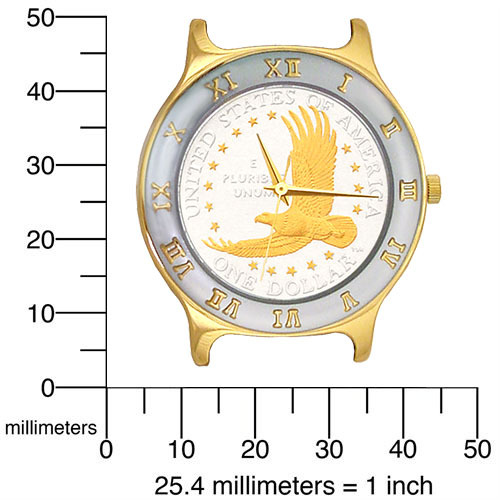 Featuring a genuine US Dollar designed for the new millennium, this watch is perfect to express one's appreciation for liberty and the American Spirit. The soaring eagle is meant to represent freedom over the great expanses of the USA. The coin's beauty is further enahnced with precision gold accents on a pure silver overlay. 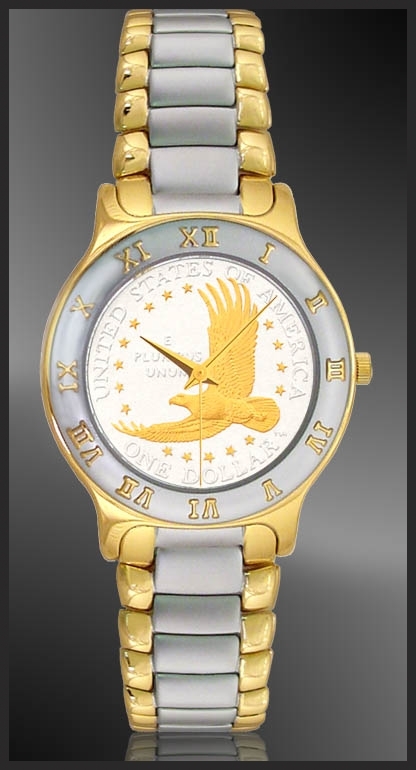 The clssic styled raised Roman numeral bezel is also accented in gold. Both case and band are solid stainless steel with a high quality 3-micron heavy gold plate, waterproof up to 5 atmospheres. Comes standard with a genuine Swiss Quartz multi-jeweled movement. Certificate of authenticity, uniquely numbered signet and lifetime warranty against defect.